The bookmarks were #5 on my list of DIY Meaningful Christmas, to help out a local charity in lieu of Secret Santa or gift exchanges with friends. 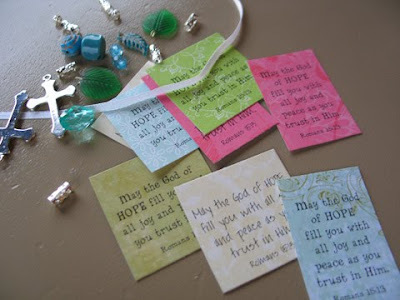 My "Girls' Night Out" group made 50 scripture bookmarks, 40 of which were gifted to the clients of our local crisis pregnancy center. 10 ladies helped that night and they each got one to take home, too. We all brought appetizers and crafted, chatted and snacked away about 3 hours. We got the bookmarks completed up to where the top coat needed to dry for several hours. The next day a couple of us strung the ribbon, beads & charms. Because our bookmarks were for a charity, and the ladies donated their time and money, we needed to keep our cost down. We managed to do ours for about $2 each. 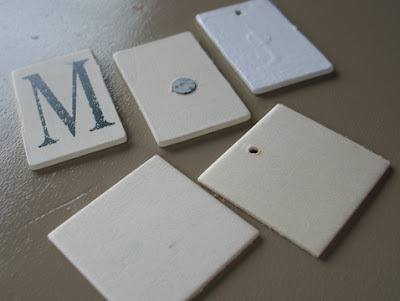 I found these magnetic alphabet wood tiles from Michael's. They're about 1" x 2" . We also used some squares that just came in a package of assorted sized squares - of which we just used the largest size. Be sure they are big enough to fit a scripture. You can find shapes with nicer wood than these if you don't have to work in bulk or keep to a strict budget. Love this idea! Yours turned out so pretty! I will be following you--thanks for your sweet comments on my Lamp PB knock off. I would love to gave you follow me as well. I didn't see a follower area so I am adding your button to my Inspiring Blogs section. I love those. While reading your great instructions I had a thought, rare moment:) I wonder if those counter samples that are in the kitchen section would be the right size. Just a thrifty thought. Wow, those are gorgeous! Thanks tons for the how-to, I'll be linking. I found your blog thru One Pretty thing. I really love them,what a creative idea! Oh my goodness. These are beautiful! Thank you for the tutorial! I just LOVE those! And what a great thing for you all to do! What a great gift. I will need to try these. 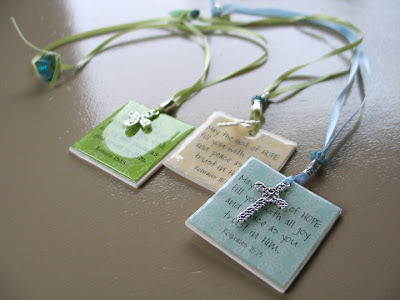 What a great gift for the pregnancy center. Thank you. I am a public health nurse for first time low income mother, what a touching gift...I am sure it was cherished! What a pretty gift, the glaze really "makes" it. Thanks for sharing. What a beautiful idea - thanks for sharing! Wow what a great idea. You certainly have great tallent and ideas! Stopping by from SITS - happy Wednesday. Great idea. I wish I'd found this during your Christmas gifts series, as I know that when I was in the US it would've been much easier to find the glossy goo than here in Costa Rica. I'd love to make them, but doubt the materials exist here. Thanks for sharing. Popped in from SITS! That's gorgeous--perfect for V-day gifts that aren't chocolate!!! I'm one of the people who requested a tutorial when you first posted this craft, so thank you! What a great project and big kudos to you for having your designs in Hallmark. How wonderful. I could learn a thing or two from you. @ Cheri - thanks! If you're registered at Blogger, you can always hit the "follow" button on the official blogger header of anyone's blog. @ Jessica - I haven't heard of PPA, but thanks for the great tip!! I'll look for it! @ Everyone - thanks for the kind remarks! I always love to see photos if you do something similar! 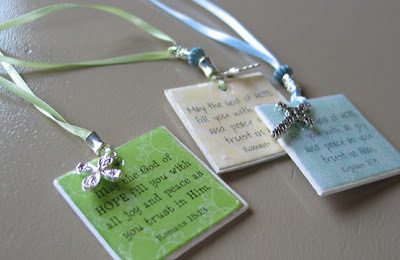 These are are great idea and I know the recipients of such a gift will love them too! These are amazing..What a wonderful piece of art. Another thrifty backing would be polymer clay. You just roll it flat and cut it to size. Put the hole in before you bake. The quote could either be done as an image transfer before you bake or added in the same manner as this tutorial after you bake. 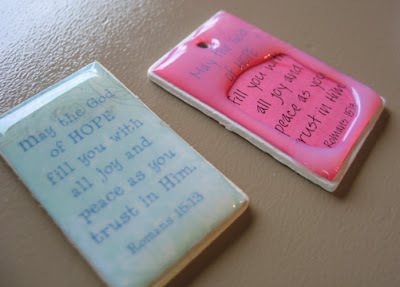 @ Anonymous - Thanks for the polymer clay alternative! Wonderful! Yes the mullet Saga was hilarious. These are great! Thanks for sharing. I've posted a link. 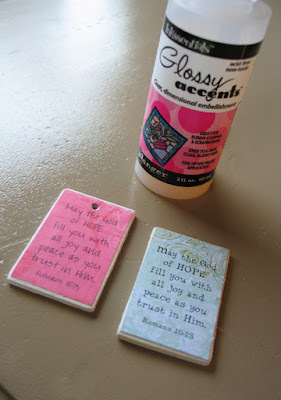 I'm going to have to remember these for my next ladies craft night. This so simple and perfect! I love scripture verse. Thanks for sharing. I've posted a link. Very inspiring! I might have to brave this one!! =) Love that you are using your talent to encourage the Crisis Pregnancy Center! New follower for sure! Blessed to have found your blog! Do you have to use a stamp or could you print with your computer? These are gorgeous! Dana - I printed my text from a black and white printer on colored scrapbook paper. It worked great! 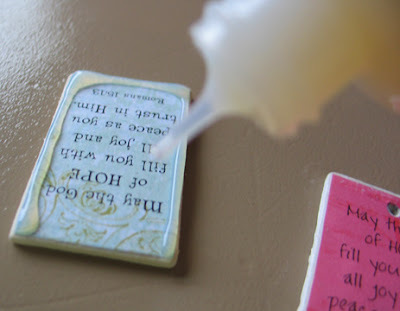 I am looking at making 50 of these bookmarks...do you remember how many bottles of Glossy Accents you went through to make 50 bookmarks? Thanks! Thanks for your question: I bought 3 bottles of the Glossy so several ladies could be working on that step at one time. But there was some left in each when the whole project was completed. 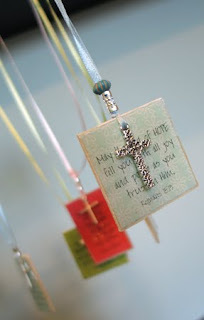 Saw this on Pinterest - fabulous idea!!! 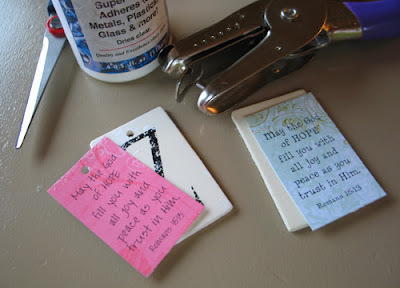 Just wondering if you could use sample cards of laminate from kitchen section of hardware store to put verses on? I will have to remember to pick-up some next time Im in hardware store & try this. Thank you for sharing with us!